The UNL Encyclopedia is the collection of the empirical and scientific knowledge, wisdom and culture of all peoples expressed in UNL. With the UNL-enabled convergence of language, information and digital technologies, it is possible to assemble all forms of knowledge and culture in a common asset for humankind, while preserving “local” diversities. The merit of the UNL is that it enables each people to use its native language to share its world of knowledge and culture with other peoples in their respective languages. In this sense, the UNL Encyclopedia is truly “universal”. In present history, interdependence among nations ? enhanced by Information and Communication Technologies (ICT) ? brings economies, cultures, knowledge systems and political regimes closer to each other. But language barriers prevent a fair information flow, access to knowledge, trans-cultural exchanges and mutual understanding among diverse peoples. As a result, conflicts and clashes increase as globalization threatens the identity and survival of local cultures. The UNL Encyclopedia takes advantage of the ICT media to break down barriers, and to provide all peoples with a platform for sharing their world of art, knowledge, wisdom, values, ways of life, feelings and beliefs with others. The UNL Encyclopedia therefore emerges as one of the “natural historical responses” to meet the need for fairness by promoting reciprocal knowledge while preserving cultural diversity. Existing encyclopedias, such as the Britannica, Larousse and others, are written in English, Chinese, French, Japanese, Russian, and many other languages. The UNL Encyclopedia will be written in UNL, the semantic network language for computers. Developing the UNL Encyclopedia consists in describing in UNL the multi-diverse forms of knowledge that exist in texts or in the minds of humankind. The UNL Encyclopedia integrates those descriptions (UNL Documents) into the UNL Ontology by linking them to corresponding UWs. The UNL Encyclopedia is a universal multilingual encyclopedia navigating knowledge through the UNL Ontology for human, and provides of necessary knowledge descriptions for computers to process. The UNL Encyclopedia consists of two parts: the UW System (a hierarchy of concepts) of the UNL Ontology and the contents of the UNL Encyclopedia. Contents of the UNL Encyclopedia are UNL Documents describing various knowledge or information. Every UNL Document of the UNL Encyclopedia is linked with the UW it describes. UWs of the UW System are the entries to their descriptions of the UNL Encyclopedia respectively. All UWs and binary relations included in each description of the UNL Encyclopedia are keys for the description. Figure 1 shows the structure of the UNL Encyclopedia. “UNL Doc”, which stands for “UNL Document”, shows the description of each UW. The UNL Encyclopedia covers extensive knowledge at different levels. In the upper levels of the UW System, knowledge on general concepts, which is considered to be the core of the UNL Encyclopedia, is described. Descriptions of concepts are mainly about what they are, how to make or use them, when they are true, and so on. In the lower levels of the UW System, it is possible to describe not only ordinary specific concepts but also the contents of archives and books. Whole contents of archives or books are considered as compound concepts. This knowledge constitutes parts of the UNL Encyclopedia: the UNL Archives and the UNL library. In the UNL Encyclopedia, knowledge (the encyclopedia) about each concept identified by a UW is described in UNL Expressions. Every UW included in the description of UNL Expressions also takes a position in the UW System. These UWs will therefore become keys of the UNL Encyclopedia, and knowledge about them is also described in the UNL Encyclopedia. This architecture guarantees every description of knowledge for using other pre-described knowledge, and users can easily find knowledge for UWs crossing encyclopedia descriptions. Knowledge is described as UNL Expressions in the UNL Encyclopedia. Once a new knowledge is registered in the UNL Encyclopedia, it is possible to search and view the knowledge in a desired language using the UNL system. For details see http://www.undl.org/encyclopedia/. The UNL Encyclopedia can be accessed through the UNL Explorer at www.undl.org/unlexp/. The UNL Explorer is a web-based, UNL-based Multilingual Intelligent Information and Knowledge Management System. It provides users with an integrated environment that users can search for and edit knowledge and information based on UNL without language barrier. It manages and navigates knowledge and information based on the UW System of the UNL Ontology. Different from any ordinary encyclopedia, instead of a word of a natural language, a UW (concept) is linked with a UNL Document describing knowledge and information on the UW. This set of UNL Documents is called UNL Encyclopedia. The UNL Explorer provides means to search for or edit knowledge and information provided by the UNL Ontology as well as the UNL Encyclopedia. 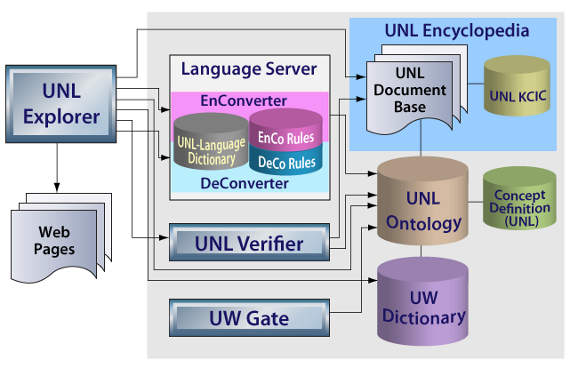 In the UNL-based Multilingual Intelligent Information and Knowledge Management System, UWs and binary relations are keys for knowledge and information, UWs are linked with equivalent words of natural languages, and binary relations are enconverted from natural language inputs. Using the UNL Explorer, users can search for, view and edit knowledge and information in UNL and natural languages. Search can be made about linguistic and semantic knowledge provided by the UNL Ontology and about general knowledge and information provided by UNL Encyclopedia. Search for information of UNL Encyclopedia can be made by content or keyword (keyconcept) search, or though navigation of the UW System of the UNL Ontology. UWs and binary relations included in UNL Encyclopedia are all keys for knowledge and information in which they included. Search on the UNL Ontology is available in a wide range of languages including UNL. Search on the contents of UNL Encyclopedia is available in UNL, English and Japanese. 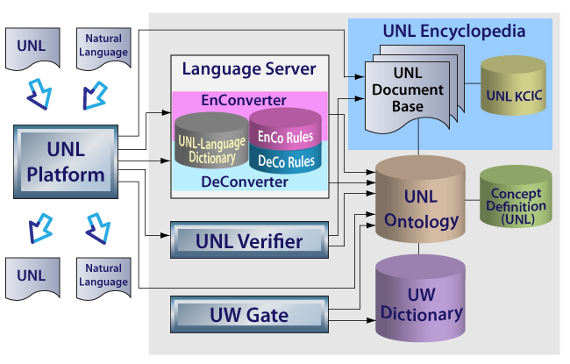 UNL Explorer carries out conversion between UNL and natural languages through language servers. Whenever if a language server is ready, it can be connected to the UNL Explorer. In near future, query in UNL, English and Japanese will be possible, and search and query will be possible also on English and Japanese web pages of the Internet. Editing on information is currently limited to authorized developers. This will be improved in future to be based on an openly-editable model. 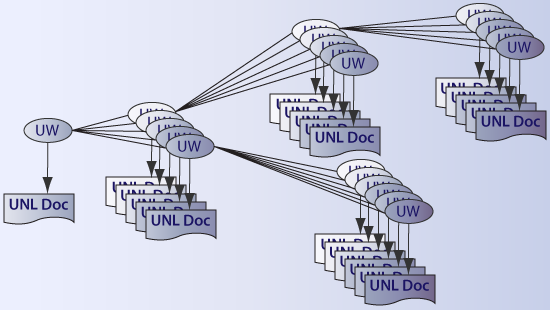 All possible semantic co-occurrence relations are defined between UWs in the UNL Ontology. Each possible relation is defined between every two most general UWs that can have the relation. On the UNL Ontology, semantic co-occurrence relation search can be made in three ways: to ask whether a relation between two UWs is true or not, to ask what UWs can have a relation with another UW, or to ask what relations are possible between two UWs. Every search is carried out by inference using the property inheritance mechanism of the UW System. Content search is carried out based on UNL Expressions. UNL Explorer allows users to input a query of a natural language for content search on UNL Encyclopedia. When a natural language is inputted, UNL Explorer first request its language serve to convert it into a UNL Expression. Search is carried out using the UNL Expression. UNL-based search uses semantic binary relations. This makes it possible to provide less ambiguous results. In addition, by using property inheritance mechanism of the UW System, knowledge and information described by synonyms is possible to provide. In the UNL Ontology, an intentional definition is given to a UW to specify all the essential properties of the concept of a UW. They are necessary and sufficient conditions for belonging to the set (class) defined by the concept of a UW. For example, the definition of “author” is “a person who writes books or a person who wrote a particular book”. Based on this definition, “Oe wrote Silent Cry” can be inferred using knowledge “Oe is the author of Silent Cry”, and vice versa. This inferential mechanism is used in content search of the UNL Explorer. The aim of the UNL Explorer is to provide users with an integrated language barrier free environment for access to information. Through the UNL Explorer, users are able to search for information described in whatever language using their native languages, or users are able to provide or edit information using their native languages. For these purposes, it is necessary to have information and knowledge in UNL. Once they are in UNL, they can be used in search from any language. And, it is necessary to increase the number of language servers to deal with conversion between a natural language and UNL. A graphical editor of UNL Expressions works together with the UNL Explorer. Using the UNL Graphic Editor, UNL Expressions can be displayed in graphs and can be modified by editing the graphs. The UNL Explorer can be accessed at www.undl.org/unlexp/. The UNL Platform is a UNL-based Multilingual Document Development web application. It provides users with an integrated environment that users can produce UNL Documents from natural languages and vice versa. Producing UNL Documents consists in enconverting in UNL Expressions natural languages. The UNL Platform integrates all necessary tools of the UNL System and provides various functions to help users in producing UNL or target language documents. Depending on the needs or purposes of users, the UNL Platform provides different levels of functions to meet the needs. Using the UNL Platform, users can directly enconvert sentences of a language from a HTML formatted document into UNL and create a target language HTML document by deconverting the UNL into the target language. In the simple mode of enconverting process, word selection can be manually done by users in a simple way. In the professional mode, modifications on dictionary entries of words or morphemes are possible in word selection. With this function users can produce accurate UNL Expressions. UNL Expressions can be edited using UNL graphic editor. The UNL graphic editor consults the UNL Ontology to verify the results of modifications. The current version of the UNL Platform is available to deal with English and Japanese input and output. In near future Chinese language will be included. The UNL Platform offers three levels of enconversion, word modification-based, word selection-based, or automatically. An automatic enconversion allows user to directly convert a sentence into a UNL Expression. Word selection-based enconversion offers a way to generate accurate UNL Expressions. Word modification-based enconversion provides users with the means to control and obtain accurate UNL Expressions. In addition, a semantic annotation-based enconversion will be also possible. The UNL Platform allows inputting a HTML document, directly or through a URL. If a HTML document is inputted, sentence detection and retrieval are automatically carried out. Layout information of a HTML document is stored together with UNL Expressions of the texts. The layout information is used to form a target language HTML document. Formation of a target HTML document is automatically done when a deconversion of UNL Expressions of such a HTML document is required. With this function, the UNL Platform can be used to translate a web page. A graphical editor of UNL Expressions works together with the UNL Platform. Using the UNL Graphic Editor, UNL Expressions can be displayed in graphs and can be modified by editing the graphs. An integrated development support tool of UNL conversion is under development. This tool provides various functions to help to improve or develop rules and dictionary of enconversion and deconversion. Using this tool, users can edit existing conversion rules and dictionary entries or start to create rules and dictionary entries for a new language. The UNL Platform can be accessed at www.undl.org/unlpf/.